Data released Friday exacerbated fears of a global economic downturn. AUD/USD set to fall in the upcoming quarter according to sentiment. The AUD/USD pair is set to close the week marginally higher around the 0.7100 level, retreating from a 0.7168 peak, this last a result of the latest US Federal Reserve announcement. The ultra-dovish turn from US policymakers was rapidly reverted amid mixed Australian data and collapsing equities, with Wall Street failing to take profit from Fed's dovish stance. According to the official release, Australia added fewer jobs than expected in February with a large loss in full-time positions. The unemployment rate, however, fell to an eight-year low of 4.9%. Jobs creation was just of 4.6K with part-time positions up 11.9K and fulltime ones down 7.3K. Housing-related data also weighed the Aussie lower with the Q4 House Price Index down 2.4%. The RBA, which has kept the cash rate on hold at a record low of 1.5% for over two years now, is now closer to a cut than to a hike. Slowing global growth and dovish central banks' twists, as seen this week, are no news. The trade war and Brexit either. However, the developments from this past week just confirmed that fears are largely justified. In the trade war front, talks continue, with US officials trying to clinch a long-term agreement, always with Trump's target in the middle of reducing the trade deficit. This week, some comments made the rounds suggesting that the US President wants a compromise from China to purchase double or triple the goods China proposed back in January. A trade deal is 'close' according to what the US President said this Friday, ahead of a fresh round of talks this upcoming week. EU Markit PMI sunk to 6-year lows with French indexes falling into contraction territory, as well as German Manufacturing one, down to a whopping 44.7. US data was also tepid but remained in expansionary territory. Nevertheless, Wall Street collapsed with the news, dragging the Aussie lower. None of these issues will be solved next week, neither in the next month, giving the greenback a slight advantage over its commodity-linked rival. These next few days, China won't be publishing relevant macroeconomic data, while Australia will post some minor data, leaving the pair in the hands of sentiment. 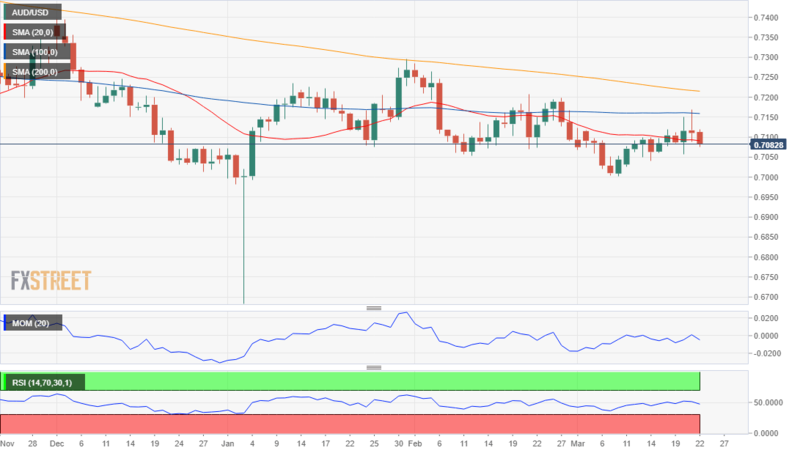 The pair retains a bearish stance according to the weekly chart and despite the absence of directional momentum in technical indicators, as, this week's advance was rejected by sellers aligned around the 20 SMA, while the 100 and 200 SMA continue heading lower over 400 pips above the current level. Technical indicators hold as said, directionless and below their midlines, in line with further slides ahead. Technical readings in the daily chart skew the risk to the downside, as the pair is set to close a few pips below a bearish 20 SMA, after topping mid-week at around the 100 DMA. Indicators turned south, but so far remain stuck around neutral levels. The pair has been ranging in the 0.70/0.71 region since late February, with the 0.7000 level being a critical support for the upcoming days, as a break below it could open doors for a test of 0.6820. Resistances remain the same, with 0.7100 price zone being the first ahead of the 0.7150/60 region and the 0.7230/50 price zone. The FXStreet Forecast Poll shows that sentiment is aligned with technical readings, as bears dominate the poll. Bearish interest, however, decreases as time goes by, with weekly sellers at 64% and quarterly ones at 43%. The Overview chart shows that the possible targets accumulate below the current level, the same in the 3-month view. Those betting for gains above 0.7200 are still too few to move the barometer in favor of the Aussie.